48,49,50………………………………………………half way and it is still an interesting journey. On # 49 and 50 I got out the Pan Pastels. 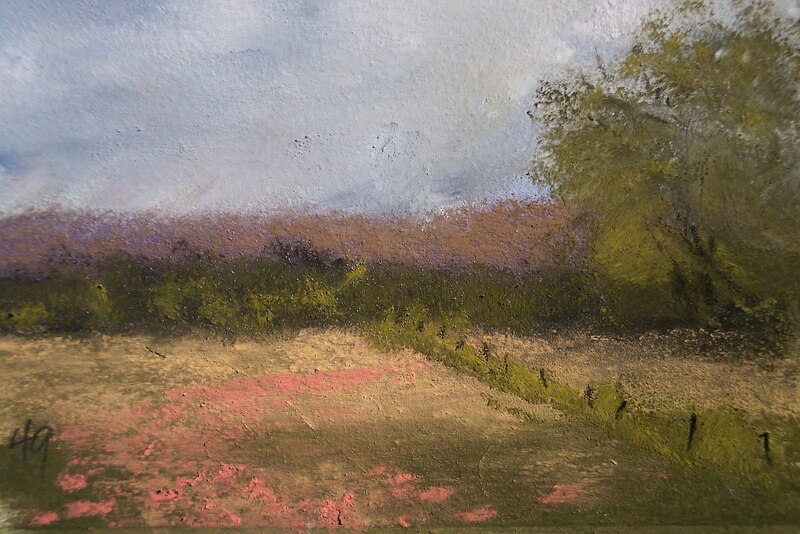 49 has the pink hint of field flowers and is done on a pale yellow Colourfix paper. 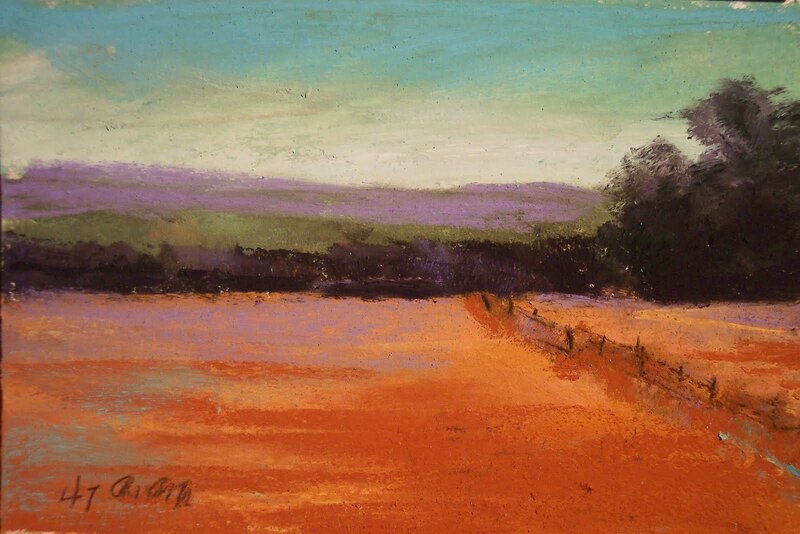 I used a couple of different applicators with the Pans and didn’t get beyond the underpainting on this paper. The Pans didn’t seem to like to stay on the paper very well. It was slightly better with the Wallis paper because, I am certain, the sanded finish. You don’t seen to get a great cover with these, even as brilliant as they seem. I didn’t do anything beyond the base underpainting on either because of that. The golden fields with purplish sky was the one on Wallis. I think I will try some with a wet technique and see how that works with them on sanded paper. 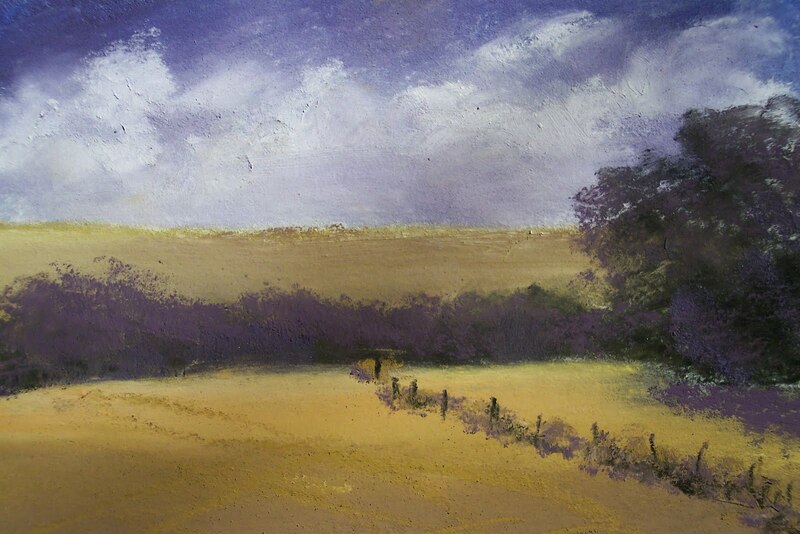 Steve Hill did his demo at the NPS meeting with them – underpainting, again for the most part on LaCarte paper. Haven’t tried that. I am hoping I find something better with them as I like the visual appearance of the landscape set as you see it in their containers…but I need to get that value on my paper and so far haven’t gotten that. Neither of these would have looked like they do without painting over them with some Schmincke sticks. This is a project to learn by and I will try them again. This entry was posted on Saturday, February 27th, 2010 at 6:56 am	and posted in Uncategorized. You can follow any responses to this entry through the RSS 2.0 feed.